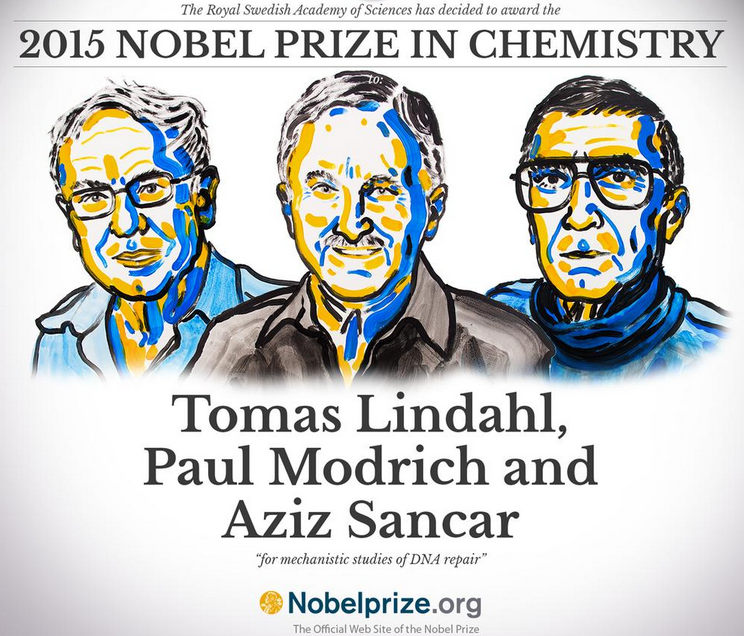 National Institute of Health (NIH) grantees received the 2015 Nobel Prize in chemistry. NIH’s National Institute of General Medical Sciences funded their research. The official Nobel Prize website also notes a third recipient, Tomas Lindahl, affiliated with the Francis Crick Institute and Clare Hall Laboratory, both in the U.K.
“This basic understanding about cell function has led to the discovery of the causes of genetic conditions associated with cancer and is being used to develop new cancer treatments. NIH is proud to have supported this work,” NIH Director Francis S. Collins said in a statement. NIH is the nation’s medical research agency located in Bethesda that includes 27 institutes and centers part of the U.S. Department of Health and Human Services.